Quids in aims to get a busy day off to a good start when going to post for the Juvenile hurdle at Hereford (1.50 pm), he made his hurdling/stable debut at Wetherby when finishing 4th in a competitive race. He seems in top order at home and providing he copes with the heavy ground he should be very competitive. Our next runner of the day is on the all weather at Newcastle (3:00 pm) where Spirit of the Vale aims to maintain our very impressive strike rate on the surface (80%). 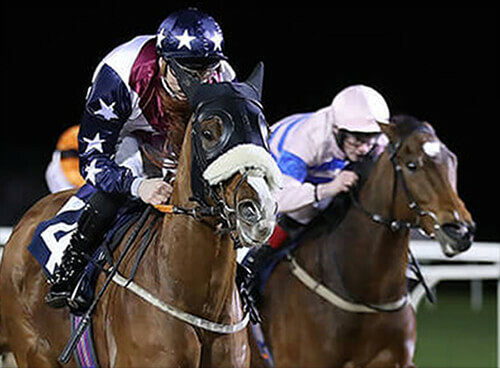 The application of the hood and the added bonus of Kevin Stott taking the ride should result in a good showing providing the race doesn't come to soon after finishing 6th in a slightly more competitive race on Saturday night at Wolverhampton. What a Joke is our final runner of the day when he aims to break his maiden under rules. As a point winner we always felt like the best of him would be seen over the larger obstacles, this is just his second start over fences so remains unexposed after running well in a good race last time. He seems to have benefitted from a small wind operation since his last run and goes to Hereford (3:20 pm) in very good order.